SARASOTA COUNTY – Residents and visitors are encouraged to "know your zone" by checking the updated 2017 evacuation zone map now available online in preparation for the 2017 hurricane season. The Florida Division of Emergency Management recently provided Sarasota County with an updated Sea, Lake and Overland Surges from Hurricanes (SLOSH) model from the National Hurricane Center. 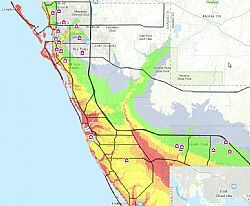 Sarasota County Emergency Management, in coordination with its municipal partners, reviewed the new SLOSH model and created the new evacuation zones for the 2017 evacuation zone map. "It is extremely important for all residents and business owners to understand their evacuation level and the vulnerability of their home or business to storm surge," said Sarasota County Emergency Management Chief Ed McCrane, adding, "Even if residents checked their zone last year they are advised to check it again due to this 2017 update." Tropical storms and hurricanes produce strong winds that push seawater ashore, creating deadly storm surge. Storm surge inundation describes the height of water above ground level. In Sarasota County, storm surge inundation is communicated through ranges of heights known as hurricane evacuation zones. Hurricane evacuation zones are classified using letters A through E, with areas not within a hurricane evacuation level being declared, "outside of the evacuation area," or N/A. Storm surge inundation heights range from ground level up to 32 feet. Evacuation Zone A is considered to be "lower" than Evacuation Zone E.
Residents and visitors can learn about storm surge and hurricane evacuation zones by visiting the "All Hazards" page on the county's website, scgov.net , by looking under Emergency Services. Once there, click on the "Evacuation Zones" tab and type a home address in the search box to see where that home is located in relation to the evacuation zones.